According to the figures of Federal Statistics Office, showed Europe’s largest economy slowed sharply as the year wore on. A weaker global economy and problems in the car industry, caused by new pollution standards, have been cited as contributing to the slowdown. At the start of 2018, the German economy had been expected to grow by 1.8%. Growth was 2.2% in 2017. 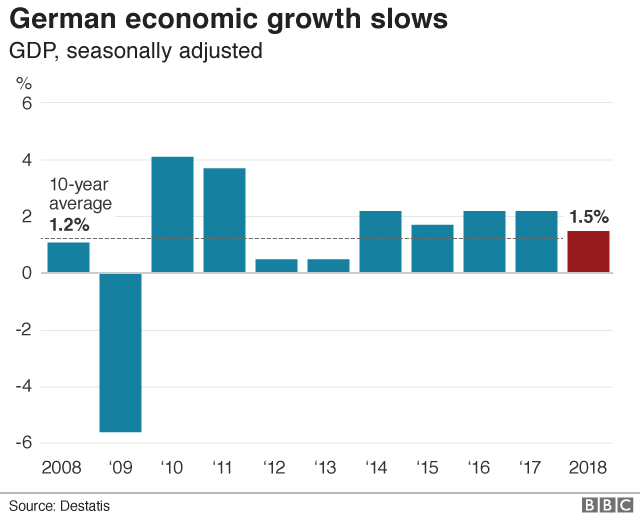 Germany’s economy had shrunk in the third quarter of the year, by 0.2%, with global trade disputes blamed for the contraction. There were fears that Germany was at risk of following that with another quarter of negative growth, something that would have put the country into recession. But initial calculations by independent economists suggest the economy may have grown by about 0.2% in the final three months of the year. What African country stand as the “last friend” of Taiwan?